A Mountain Adventurer with super slide, ladder beam with sling swing and trapeze bar combo, firepole (silver special order), ladder, super high rock wall and timber sandbox cover. This unit features the 4.4m super slide plus a cargo net and a super height rock wall mounted on the rear, a ladder beam with two sling swings, bottom clubhouse and wood roof upgrades. This package has the enclosed spiral slide, bottom clubhouse and super high rock wall on the taller deck, plus a ladder, slide and cargo net. On the two-position swing beam there is a sling swing and toddler swing. With stunning views from the top deck, this is an almost standard package #5 with a toddler swing replacing one of the sling swings. This Mountain Adventurer has a monkey bar, ladder, firepole, bottom clubhouse, in-club picnic table, super high rock wall, 4.4m super slide, wood roof upgrades and a two-position swing beam with two flat seats. At the back there is a one-position swing beam with gym rings. With a selection of brightly coloured accessories, a Mountain Adventurer with enclosed spiral slide, bottom clubhouse, cargo net, ladder, wood roof upgrade and ladder beam with two sling swings. Scale the heights with a Mountain Adventurer Clubhouse. With two playdecks at 1.5m and 2.1m, the Mountain Adventurer allows your young explorers to scale the heights. The 1.5m deck is the base camp, then a mini ladder gives access to the summit. Here you can fit either of our two longer slides – the 4.4m Super Slide or the fabulous tube slide. And to get up maybe add a ladder or a gangplank. Or if the kids are really adventurous we offer a super high rock wall or cargo net which goes all the way up to the top level. And like all our back garden climbing frames there is a choice of swing beams and loads of different sorts of swing seat to choose from. The Mountain Adventurer really is big. In fact we think its one of the biggest garden climbing frames you can buy. With the top of the roof nearly 4m above the ground the upper deck really gives a fantastic vantage point over the garden. But it is properly built too. 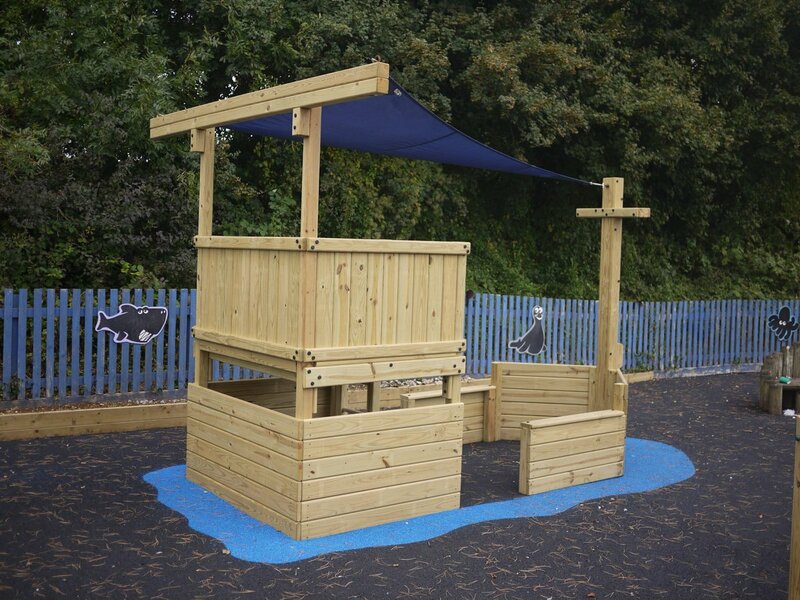 Our double deck structure makes for a solid and stable construction – and our play equipment doesn’t need ground anchors to stop it toppling over like so many on the market. To see the full range of accessories to go on our residential play equipment click here. The slideshow above gives some examples we have installed already. Or go to our photo album to see some more Mountain Adventurers to inspire you. Like all our systems you can customise the layout to suit your needs with different accessories. Two heavy duty vinyl tent tops.